Effectively merging field operations with technology can be a challenge. Enabling on-the-go crews to work from any location. 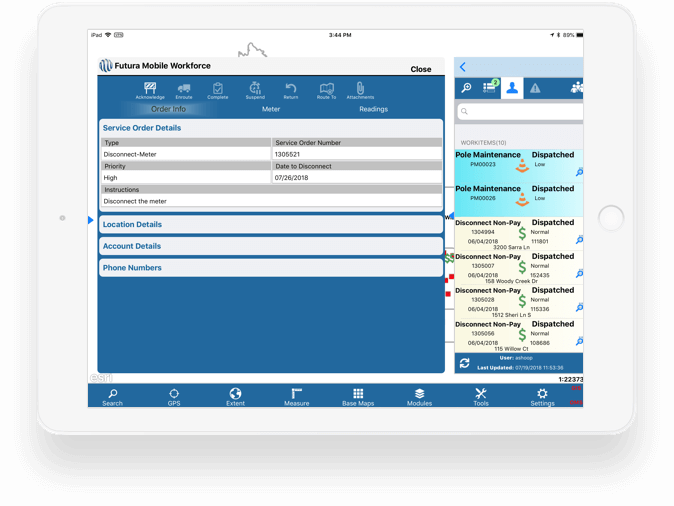 Futura FieldPro for iOS enables mobile crew members to access data in a cached environment. Its intuitive interface boasts both configurable skins and user-friendly toolbars. Includes quick & advanced attribute search capabilities, measure tool, select and tap to identify features, zoom to GPS location and “follow-me” functionality, electric network tracing, map notes, and more. Call us today to talk about how FieldPro can support you and your team. Replace cumbersome, outdated paper maps with a fully functional moving map featuring digital searching and GPS capabilities. Sync damage assessment, system inspections, vegetation management, and joint use audits directly with GIS. Quickly assess storm damage, import inspection photos, and track and manage right-of-way clearance with one device. Work outages, complete service orders, Stake Jobs and perform asset inspections in the field with integration back to Futura's Outage Management, Staking, Mobile WorkForce, and Indigo applications. Sound like something you need? We'd love to show you more! 678 906 2575Rather fill out a form? © 2018 Futura Systems, Inc.